Free instructions! 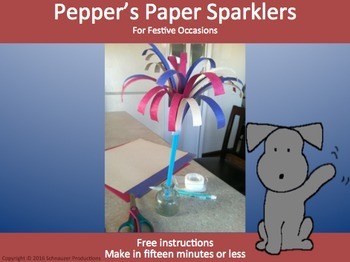 Pepper's Paper Sparklers. Make in fifteen minutes or less. Use for any occasion that requires fireworks, or for a birthday party or wedding! Join Pepper for Independence Day and U.S. Symbols, Bastille Day, or Cinco de Mayo. If you have questions, require any modifications made by us for free or would like additions to this product, please Ask a Question on the Schnauzer Productions page under the Ask a Question tab. After downloading this product, get TpT credit towards future purchases by providing both a fair rating and comment on this product. This work is licensed under a Creative Commons Attribution-NonCommercial-NoDerivs 3.0 Unported License. 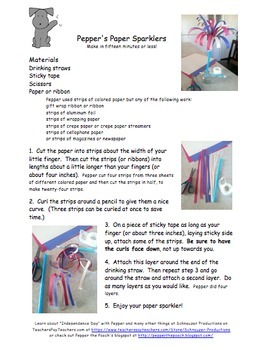 This means you may use and modify it for your classroom or home and make copies for your students. You may encourage other teachers to buy their own set of these materials at TpT. You may not sell it or modify it for commercial purposes.